NOTICE: We will be closed and out of town from Jan. 4th 2019 thru Jan. 10th. Any orders made during this time will be processed after we return on Jan. 11th. 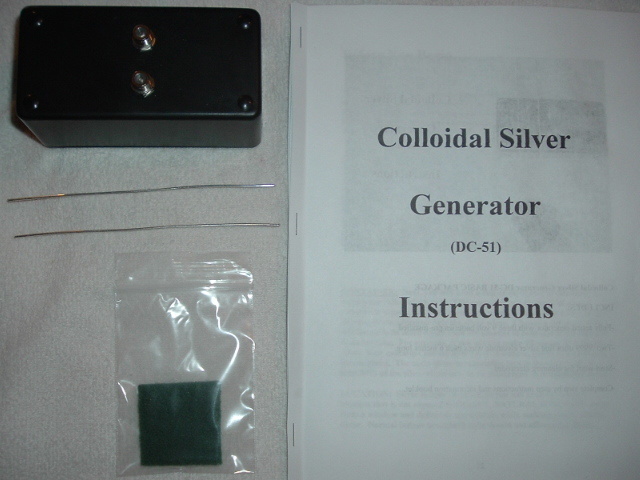 This page is for the DC-51 (battery powered) Silver Generator. To purchase our AC Powered Generator (wall outlet plug-in type), go to the AC-52 page. I do NOT take phone orders. Please use the information provided below for placing your order. The first section below is for U.S. (all 50 states) and Canadian residents ONLY, the second section is for INTERNATIONAL customers ONLY. Each PayPal button is to check out (pay) for the item or items described beside the button. Any questions, just email me. All Shipping & Handling Charges WILL BE INCLUDED in the check out total. Please take note of the WEEKLY SPECIAL or COMBO SPECIAL in each section below! After you check out through PayPal, you will be instantly sent a reciept. Your item(s) will normally be mailed out within two business days. U.S. residents (on average) receive their shipments in 3 to 5 business days. Canadian residents in 5 to 14 business days. International orders from one to two weeks. I do not ship to APO addresses. MAJOR CREDIT CARDS ACCEPTED: Visa, Mastercard, American Express and Discover. Just use the PayPal button to check out. If you don't have a PayPal account, you can still use the PayPal button to check out with your credit card. Just click on the appropriate PayPal button and scroll down to where it says use your credit card, and follow the instructions. If you desire to pay by personal check (U.S. residents ONLY), just go to the "CONTACT US" page to review the short and simple instructions. After I recieve your check and deposit it, I will have to wait up to 10 business days for your check to clear, then ship your item(s). So this process could take several weeks before you recieve your shipment. Checks should be made out payable to: DANIEL COHRAN. You may also pay by E-CHECK (electronic check) via PAYPAL, but it will take about 5 BUSINESS days for the E-CHECK to clear. After check clears, THEN I will ship your items. I also accept U.S. POSTAL MONEY ORDERS, just go to the "CONTACT US" page for the instructions. I cannot process your order UNTIL I recieve your money order. Make all money orders out payable to: DANIEL COHRAN. Note: If you need to buy more than one item, just make multiple purchases. We will ensure that you receive all of your items. (Items shipped to Canada may take up to two weeks, depending on the U.S. and Canadian postal services) - Payment accepted in U.S. DOLLARS ONLY. INTERNATIONAL ORDERS (outside the U.S. and Canada) Order Below. (Shipping time from one to two weeks). All international orders are payable by PayPal ONLY. Payment accepted in U.S. Dollars only. DC 51 CS Generator Complete Basic Kit. Includes generator, batteries, two 6 inch electrodes, cleaning pad, and instruction booklet. $69.95 US Includes Shipping. DC 51 CS Generator Kit with EXTRA set of electrodes. $94.95 US Includes Shipping. DC 51 CS Generator Kit with TDS Meter. $94.95 US Includes Shipping. DC 51 CS Generator Kit with TDS Meter AND Extra Electrodes. $119.95 US Includes Shipping. COMBO SPECIAL! - Two DC 51 Complete Kits. $134.95 US Includes Shipping. Extra Electrodes Only. One set of two 6 inch pure silver electrodes (.064 mm). $30 US Includes Shipping. TDS Meter only. $30 US Includes Shipping.